The twenty-eighth week of the year has rolled around and so it’s time to Share My World! The questions are posed by Cee over at her photography blog. Hell yeah! I pretended I was ill so I didn’t have to go to school. I ended up on a parade float singing “Twist and Shout”. I was on TV and everything! Everyone at school thought I was really ill and started a collection to help me. Here’s a picture. Oh, wait a moment. That doesn’t sound like me. That was “Ferris Bueller’s Day Off“. It wasn’t me at all 😦 . No, I’ve never been in a parade. I would go, just to see if opera is as annoyingly awful as it sounds on the TV. There’s always a chance that I’ll enjoy it, as I often enjoy arty stuff live that I don’t when it’s recorded. I wanted somewhere to post my life musings to the world – all the little bits of witty wisdom I’ve picked up over the years. However, I quickly ran out of wisdom and started writing little stories instead. I also post photos sometimes! I think it’s great that modern technology gives us a chance to put our stories and photos out there where people can see them, rather than requiring some sort of professional contract with an agent or gallery in order to showcase our work. I like Christmas dinner with the family. We all meet up, open presents, have a lovely dinner and then play little games. I also enjoy my own little traditions – “fish ‘n chip van Friday”, “pizza Saturday” and “sausage Sunday”. 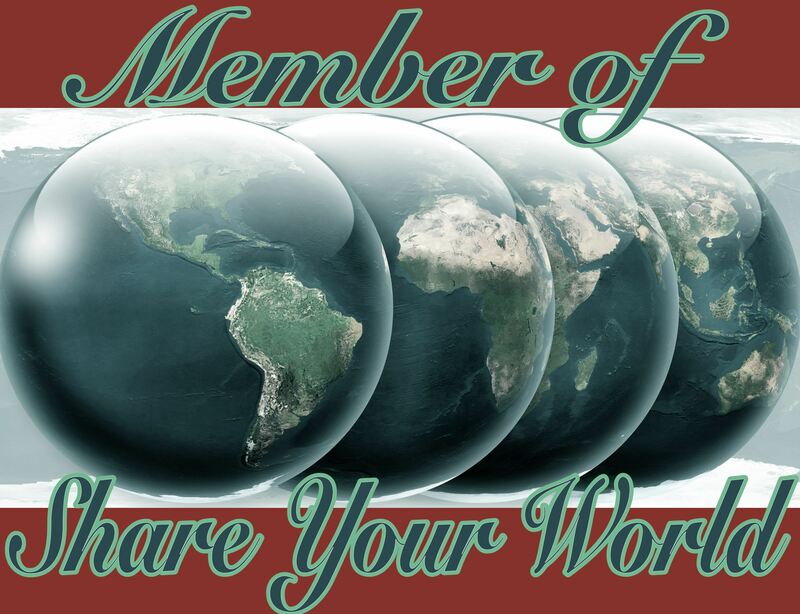 See you all next week for another edition of “Share Your World”! Funny how all my personal “traditions” revolve around food! It’s such a cool film. I’d forgotten how old it was until I remembered that I first saw it in German when I lived in Stuttgart – and that was 1990/91! And it’s even older than that. I love that movie (Ferris Bueller’s Day Off), the first time I saw it I nearly died laughing. So you’re really Abe Froman, the sausage king of Chicago? That would explain some of the food traditions! I’m glad I’m not the only one who has multiple weekly food traditions! Some people actually think I’m strange! It’s people who don’t have weekly food traditions who are weird, surely? Yes! The best way to seem unweird is to shift the blame to the normal people! Funny about food. For us it’s food and movies. And sports. And the odd dog or four. Quite a few people seem to have a favourite food day during the week. I didn’t realise you sidelined as an actor D-man 🙂 Great movie! I think my favourite movie of Matthew Broderick though is “Lady Hawk” (which came out the year before) Do you have mashed potatoes and mushy peas with your sausages? I don’t think I’ve seen that film. Mashed potatoes seems too much like hard work 🙂 I go more for a hot dog and beans sort of thing. Just came over from Russel Ray’ s blog lovin’. I wish we had a fish and chip van for Fridays, or any day. I live in fear that the fish and chip van will stop coming, so I’m always happy when there’s a large queue, even if I have to wait a little longer. At least that way it’s worth their while coming back 🙂 Apparently the “local” fish and chip shop (in the next village, Probus) is very good, but I’d have to drive there and back. And at first I was thinking OMG…that’s horrible..why would he even tell that?! Not really something I would do. Ferris had fun, though! “…I quickly ran out of wisdom and started writing little stories instead…” now that’s funny, doc! Hmm, I doubt you’ve run out of wisdom, you might not realize how smart you are or how your wisdom differs from the mob. Just a thought. I like your food days, I want to do that. Just have to decide what food and day. I guess everyone has their own form of wisdom to share, all of it relevant in its own way. I can only hope that Ferris also put his school-skipping parade days behind him!